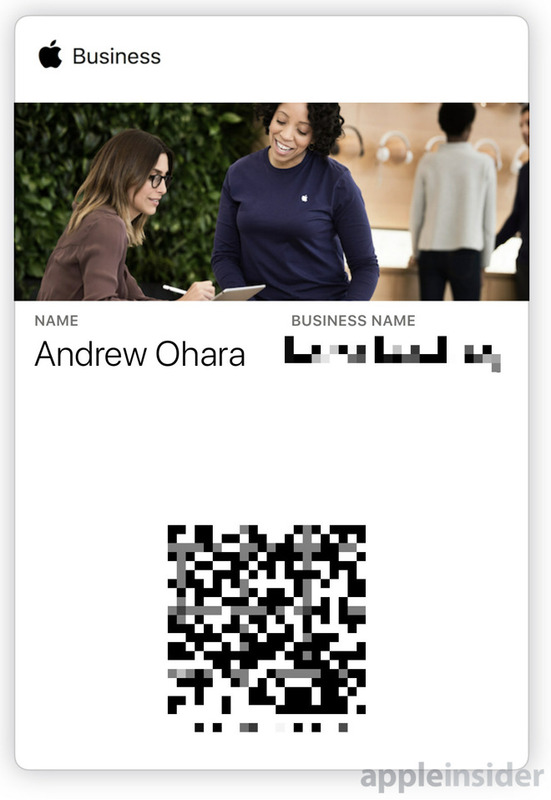 In an email to existing business shoppers, Apple's business team informed shoppers that they can now download a specific Wallet pass for use in Apple Stores. When checking out, simply present the pass to the Specialist completing your purchase and it will be linked to your account and apply any discounts you are elligble for. Previously, those who were purchases on behalf of a business would have to ask the Specialist to look up the name of the business to have it applied. Using a pass is a much quicker option and removes the problems with a misspelling or the exact name used. 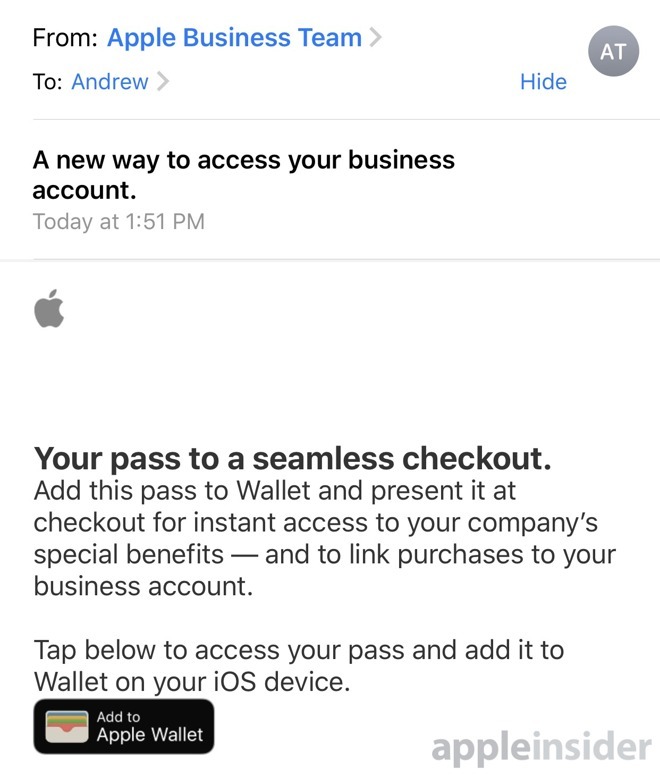 "Add this pass to Wallet and present it at checkout for instant access to your company's special benefits -- and to link purchases to your business account," said Apple's email to users. Participating in the business program with Apple is free, and can have several perks such as assistance in choosing products. For paying businesses, you also get access to loaner machines when a device is in need of a repair. After meeting a threshold, businesses unlock an additional discount on eligible products as well. 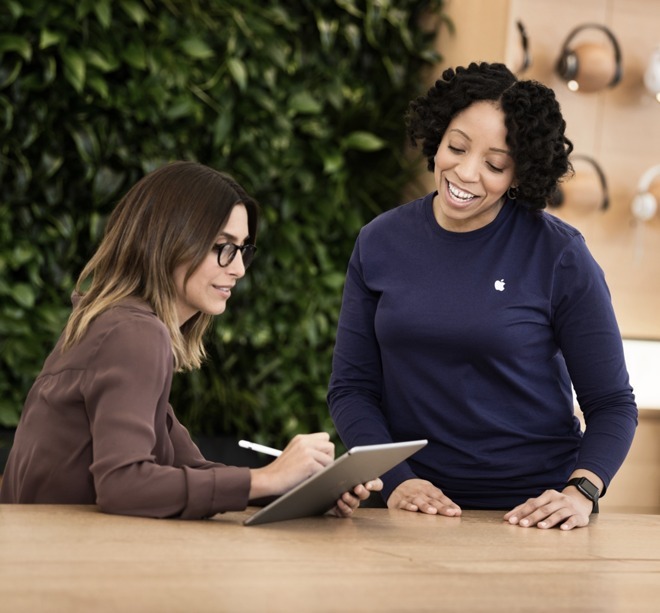 Together we can create a custom plan for your company that includes the right hardware and software, support, instore resources, and IT experts from the Apple Consultants Network," Apple's Business Team says. "And with Today at Apple programs, you can join hands-on sessions designed to take your business to the next level." To sign up for Apple Business, visit your local Apple Store or reach out through Apple's dedicated page. Maybe Apple should work with the major (real) business suppliers to come up with something similar. A single virtual card that not only charges the right business account but also stores your receipts on the cloud for consolidated easy access for accounting purposes. Got this notification as an email, but we’re happy to just go to the Apple Store and talk to the business rep instead. Those employees are usually a little nicer to deal with than the average Apple Store interactions (no knock against the floor reps).